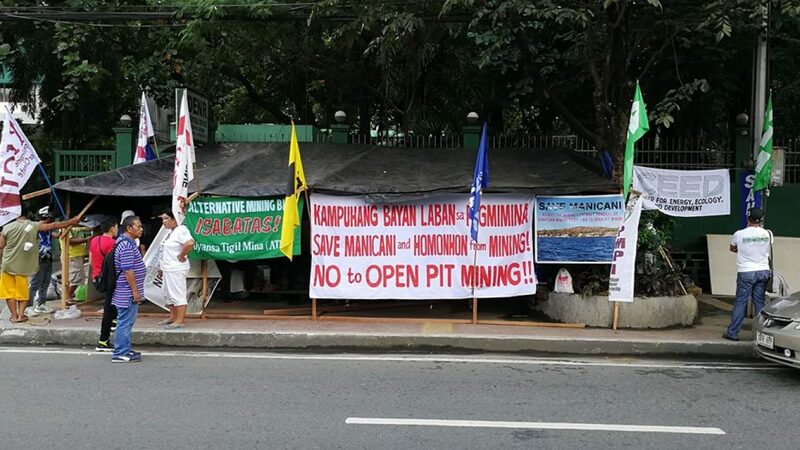 We, the people of mining-affected communities, members of civil society organizations and peoples’ movements from nations across the globe, unite and join in solidarity with the people of Manicani Island in the Philippines in their quarter-of-a-century struggle against open-pit mining in their community. Even before the grant of the Mineral Production Sharing Agreement (MPSA) in Manicani Island to the Hinatuan Mining Corporation (HMC) in 1992, the people of Manicani Island have already protested HMC’s drilling and exploration for proceeding without proper consultation and permits. In 2002, after more than a decade of persistent and sustained protests, vocal opposition of local church leaders, and complaints for human rights and environmental violations, the then-Department of Environment and Natural Resources (DENR) Secretary Heherson Alvarez finally suspended HMC’s mining operations. However, despite the suspension, HMC was still granted several Ore Transport and Mineral Ore Transport Permits, which allowed it to ship nickel ore from stockpiles for the remaining period of its MPSA. October 27, 2017 should have marked the end of open-pit mining in Manicani with the expiration of HMC’s 25-year MPSA. The people of Manicani demanded the rehabilitation of their environment and expected the restoration of their relationships, health, and livelihoods. Contrary to their demands, the local government units in Manicani, Guiuan, and the Province of Eastern Samar issued separate resolutions supporting the renewal of HMC’s MPSA. Meanwhile, the DENR has yet to issue an outright rejection of the application for renewal. We join the people of Manicani amidst renewed threats of large-scale, open-pit mining operations in their community. We have heard of the deep divisions that mining has caused in their small community. Families and friends are forced to overlook the blood they share or the relationships they’ve built to support opposing sides on mining in their community. These rifts have caused tensions and, in extreme cases, sparked violence. We have seen the environmental degradation that mining has brought to the previously pristine and rich island of Manicani, and its consequent threats to livelihoods and food security. It has resulted to deforestation of hectares of land, and the leaching and erosion of nutrient-rich soil. Farmers lament of the drastic decrease in their harvest or the total inability of their lands to produce crops. Mining has also polluted the water tables of Manicani, severely limiting the sources of potable water wells. Heavy silt from mining eroding to Manicani’s bodies of waters have slowly killed coral reefs around the island. Fisher folks decry the fact that fishing activities now have to be done farther from the island to be able to gather enough harvest. We call on the LGUs of Manicani, Guiuan, and Eastern Samar to repeal their resolutions of support for the renewal of open-pit mining in Manicani, and on DENR Secretary Roy Cimatu to issue an outright rejection of the application for renewal. The reasons for the rejection are many, varied, and undeniable—the several environmental and human rights violations committed by HMC in Manicani over the past decades; the previous suspension of HMC’s mining operations in 2002; the fact that Manicani is a no-go zone for mining operations according to Executive Order No. 79, series of 2012 because it is a protected area and an island eco-system; and the Provincial Ordinance No. 09, series of 2005 that bans open pit mining in the province. We further recognize that the struggle against open-pit mining is not endemic to the island and to the Philippines. Instead it is reflective of the numerous other struggles of peoples and communities across the globe, which are victims of decades of irresponsible and exploitative open-pit mining operations. We call on our leaders to issue orders banning open-pit mining. It is high time to recognize that open-pit mining is a form of extraction that irreversibly destroys mountains, displaces communities from their homes and livelihoods. Further, we call for more transparency in the extractive industries, in recognition that transparency fosters accountability in the extractive industries. Finally, we take this firm stand in the context of the ongoing Conference of Parties (COP23) to the United Nations Framework Convention on Climate Change (UNFCCC) in Bonn, Germany. The recent adoption and entry into force of the Paris Agreement on Climate Change ushered in a new era of urgent global climate action. It recognized that we are on a race to ensure that the world’s global temperature rise this century will remain well below 2°C above pre-industrial levels, and to pursue efforts to limit the temperature increase even further to 1.5°C. We call on our leaders convening in COP23 to recognize the role of the extractive industries in exacerbating the impacts of climate change. Deforestation of mountains removes the mining-affected communities’ natural barriers to stronger and more frequent typhoons, increases the possibility of flooding and landslides, and worsens the severity of droughts. The siltation of bodies of water contributes to the further destruction of coral reefs, which are already dying due to acidification caused by climate change. The people of Manicani stand as witnesses to this climate reality. In 2013, when Yolanda pummeled into Visayas, it made its first landfall in Guiuan. It left a massive trail of destruction in Manicani, inevitable for a small island left barren and vulnerable to the strongest typhoon that has made landfall in recent human history. On November 10, 2017, after a three-day caravan from Eastern Samar, the people of Manicani began their camp outside DENR Central Office to state their demands. We resound their calls for the Philippine Government and the rest of the leaders of the world to heed, as we have. Our coming together is a show of global solidarity with the people of Manicani, and the unity of struggles against open-pit mining and its exacerbation of the impacts of climate change across the globe. We commit to strengthen and coordinate global solidarity actions and campaigns to stop open-pit mining in Manicani and in other sites of struggles in the Philippines and across the globe that are already highly vulnerable to the impacts of climate change.